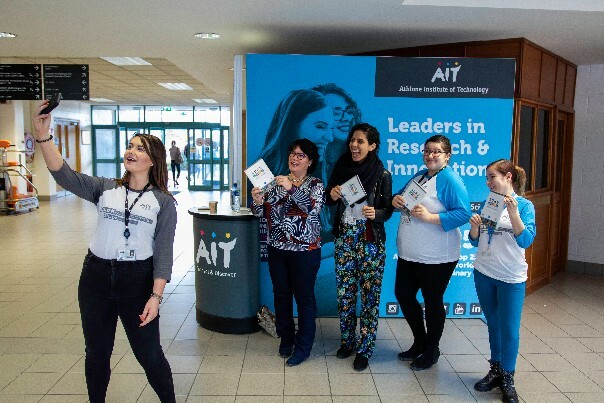 Ireland’s first conference dedicated to promoting STEM research in the technological higher education sector was held at Athlone Institute of Technology (AIT), Dublin Institute of Technology (DIT) and Waterford Institute of Technology (WIT) simultaneously on Friday, attracting crowds of more than 200 third level students. At AIT, some thirty recent STEM graduates from AIT, Galway Mayo Institute (GMIT) and Institute of Technology Sligo (IT Sligo) delivered a range of oral and poster presentations showcasing the depth and breadth of research happening at undergraduate level in Ireland. Subjects ranged from the development of new therapies to combat nerve degeneration, antibiotic resistance in animals, humans and fish, current therapeutic protocols for Anorexia and patient rehabilitation in our hospitals, and the development of new nutritional information apps which can be used to discern the quantity of sugar in our food. The prize for ‘Best Scientific Oral Presenter’ was sponsored by Abbott and was awarded to Malaysian student Lawrence Ng who demonstrated via a live Skype presentation how he had modified the chemical formulation of a popular anti-inflammatory drug to improve the length of its therapeutic effects in the body. Lawrence conducted his research under the supervision of Lecturer in Chemistry, Professor Clem Higginbotham, AIT. Lawrence, who is graduating with BSc (Hons) in Biotechnology this October, is already working in the biotechnology sector in Malaysia and hopes to start his PhD in the new year. Enterprise Ireland sponsored ‘AIT Best Scientific Poster’ which was awarded to Melissa Heanue for her work entitled “Quality of Life and Anterior Cruciate Ligament Injury”. This was conducted under the supervision of Dr Edwenia O’Malley of IT Sligo. There were two additional awards voted for by the audience using smartphone software developed by conference sponsors, Turning Technologies and piloted by Dr Anne Maire O’Brien in AIT and WIT on Friday. Michael Green was awarded the Turning Technologies ‘Best Science Communicator’ accolade for his research into Novel Iron delivery systems which was conducted under the supervision of Dr Patricia Heavey and Professor Clem Higginbotham of AIT. Finally, Pearse Dolan from AIT was awarded the ‘Best Poster by Popular Vote’ prize sponsored by the Irish Toxicology Society. His research, entitled “Sustained delivery of antibiotics in animals using novel polymeric systems”, was also conducted under the supervision of Professor Clem Higginbotham. The four awards were presented by Dr Joseph Ryan, CEO of Technological Higher Education Association (THEA) and Dr Don Faller, Dean of Faculty of Science and Health at AIT. Several industry representatives and AIT alumni, including Helen Hamilton of Abbot and Dr Barbara Cooper of Jazz Pharmaceuticals, were in attendance to give students and recent graduates advice on how to achieve a rewarding career in the Biopharmaceutical industry. Postgraduate researchers Catriona Kielty (BRI, AIT), Kerrie Ní Dhufaigh (MFRC, GMIT) and Stephan McGirr (CERIS, IT Sligo) also offered their insights into the good, the bad and the great aspects to postgraduate research. This fascinating and honest look into the ‘Life of a Postgraduate Researcher’ was intended to encourage the future matriculation of prospective postgraduate students into STEM research and to dispel any unwitting confusion around postgraduate research. Co-organiser and Science Lecturer at AIT, Dr Anne Marie O’Brien added: “If the success of this year’s conference is any indication, the SURE conference will be an important date in the undergraduate student calendar as they compete to present their final year research projects next year”.